« We’re MIXX Award Finalists! Our studio got a new addition this week in the form of an informative whiteboard that will serve as a companion to our That’s a Wrap Chart. With Starring You and animated videos, we take so many steps from project start to published art, it can be a chore just to figure out where we stand progress wise at any given point in the month. 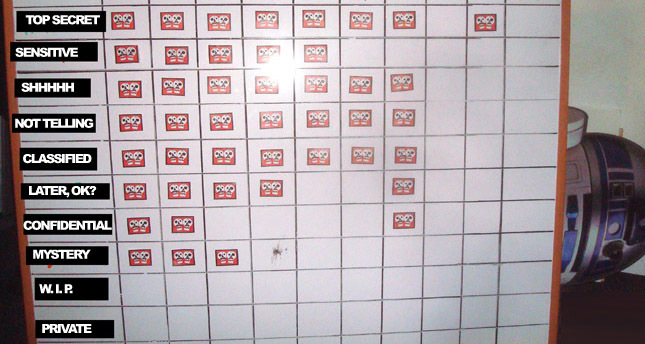 Now, as we kill each task off we can mark it as done with these little JibJab skull sticky squares that Trish designed. 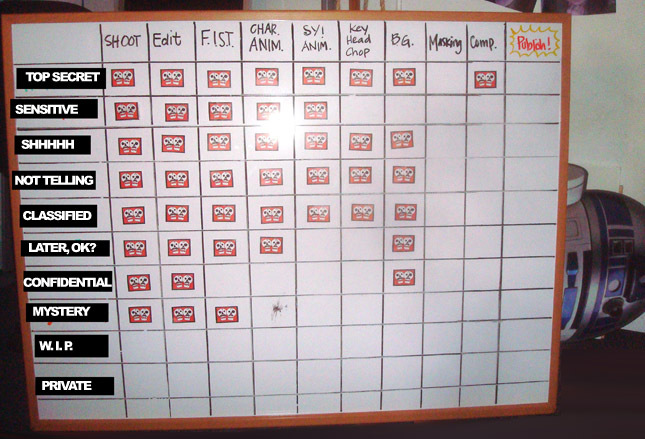 This big bad board is going to keep us all on the same page as we juggle a dozen projects at once. What are these projects that we’ve progressed so far on? We’re not going to say, you’ll just have to stay tuned. This entry was written by paulhanges and posted on September 15, 2010 at 10:46 am and filed under Inside JibJab. Bookmark the permalink. Follow any comments here with the RSS feed for this post. Trackbacks are closed, but you can post a comment.